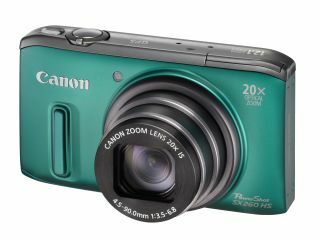 Canon has announced two new compact cameras to sit in its PowerShot range, both featuring 20x optical zoom lenses. The SX240 HS and SX260 HS are identical in specification, apart from built-in GPS in the SX260 HS. The new models are Canon's slimmest 20x zoom cameras, and come fitted with DIGIC 5 powered HS system and new Intelligent IS technology. Both cameras feature a wide angle 25mm 20x optical zoom lens with 4-stop optical Image Stabiliser (IS). New ZoomPlus technology can extend the reach of the zoom to 39x, with Canon promising a "detailed" digital zoom. The cameras are able to automatically select the most appropriate IS settings from seven modes, such as Macro IS and Panning IS. The HS System, which couples Canon's DIGIC 5 processor with the 12.1 million pixel CMOS sensor has been designed to produce low-noise images in all conditions, but especially in low-light. Canon claims that the SX240 HS and SX260 HS are capable of producing up to 75% less noise than their predecessors. Smart Auto mode is available and is capable of detecting up to 58 different scenes to determine the best settings to apply to achieve the best results. Advanced Multi-area White Balance technology can detect multiple light sources, correcting the colour balance for each to remove colour casts and give more natural results. Face ID is also included, which can also detect when the camera is photographing a sleeping baby, turning off sounds and flash. Likely to appeal to more creative photographers, full manual control is available on the cameras, along with high speed shooting at up to 10.3 shots per second. Integrated GPS is also included in the PowerShot SX260 HS. Locations can be logged at regular intervals, while the included Map Utility software can be used to view a journey on Google Maps. Full HD video recording at 1080p is included, with super slow motion 240fps video also available. The Canon PowerShot SX260 HS UK price is £329, while the Canon PowerShot SX240 HS UK price is £299. Both will be available from March 2012.